Sippers specialises in stocking wines and beers from smaller producers, as well as sourcing the ingredients for their extensive tapas menu from local suppliers. It's a very commendable aim (though for the drinks 'small' doesn't necessarily equate to 'local'). The downstairs bar space features lots of dark wood panelling, red velvet couches, gilt mirrors and barrels with stools. Footpath and upstairs dining are also available. The Sippers menu is divided into tapas and tascas. The latter actually means 'bar' in Spanish, but as Sippers explain on their website, their tascas are their smaller portions (though prices are fairly similar), so perhaps they mean them as bar snacks. In any case, tapas actually derives from the Spanish for 'lid', and there are few venues outside Spain (indeed, outside Andalucia) that actually serve genuine tapas, rather than just small portions of 'themed' food. There are some great beers on offer - St Arnou on tap, Hargreaves Hill, Red Hill and a raspberry ale. I tried a Yarra Valley Gewurztraminer, which was a little on the straightforward, fruity side. Excited by the food menu, we picked our top four plates, but decided to stagger the order, to save over-ordering. First up was calamari and octopus in besan flour and tomato jam (not sure why they use the Indian name for chickpea flour, rather than the Spanish, gabanzo). The octopus was particularly tasty and had retained good texture and the calamari was giving rather than chewy. I thought the chutneyish tomato jam was the wrong flavour match for seafood. Just as well the food tasted good, since we had waited an hour for it to come out. We were regretting our decision to stagger, and were quite bemused that tapas - ie small, lightly cooked portions - could possibly take that long to prepare. 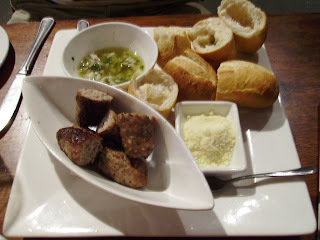 The second dish we'd ordered was pork sausage with chimichurra (a South American sauce of oil, parsley, garlic and lemon). Points for innovation with this dish: I love a make-your-own restaurant dish. In this case one puts some chimichurra in the hollowed-out breadroll, sprinkles some parmesan around, then wedges the sausage on top. The pork sausages were dense and meaty and while parmesan may seem an odd addition the whole combination worked very well. During our interminable wait for food we'd decided not to order Round 2 in protest, however we were quite impressed with what was eventually served up. 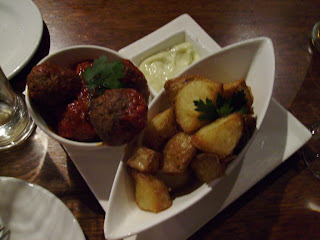 So we ordered again, this time lamb and rosemary meatballs and patatas bravas. They hadn't been shy with the rosemary and it complemented the softly cooked lamb wonderfully to make a richly flavoured dish. The potatoes were spot on, crispy and salty with a curiously green, gratifyingly garlicky aioli. 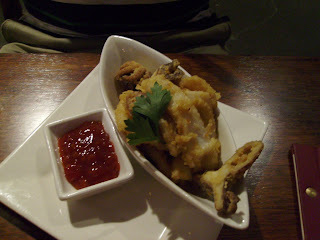 There were many other dishes we could have chosen, and they do have banquet options that would satiate a fierce hunger. The wait on the food though was really inexcusable and removed the option for us to pace our way through a tantalising menu, which is how good sharing food should be enjoyed.